Dubai in 1950 had all of 20,000 people. Even so, it had grown from 10,000 in 1900. 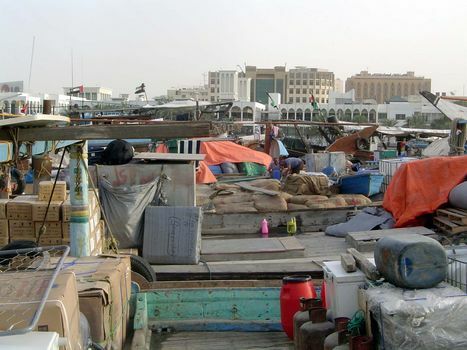 The local ruler, then as now from the Maktoum family, welcomed traders. Besides, there was a British air field, and oil exploration had begun and would transform the place after the discovery of oil in 1966. 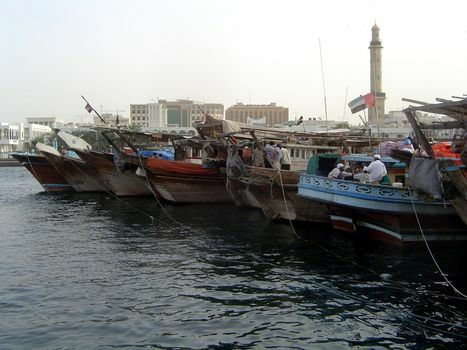 "Dubai stands on both sides of a creek, with a shallow and difficult entrance." So wrote J.G. Lorimer about a century ago in his immense Gazetteer of the Persian Gulf.... If the creek looks more substantial now, that's because it was dredged and broadened in the 1950s. The Creek was bridged in 1964, and a tunnel was completed in 1967, but pedestrians continued using the popular wooden abras, which charge a minimal toll. 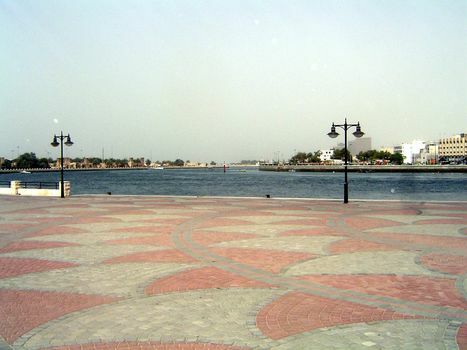 The east side of the lower Creek is the quarter called Deira. 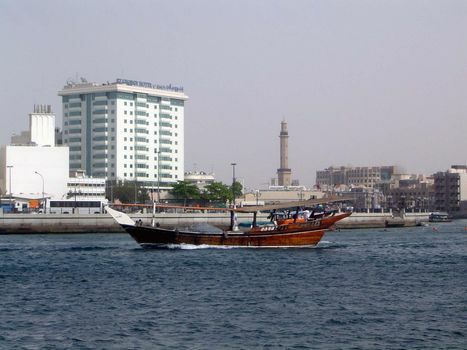 Across the water is Shindagah and, inland from it, Bur Dubai. 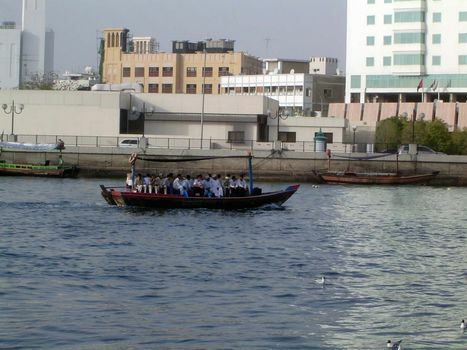 In the past, these quarters were ethnically segregated, with Arabs, Persians, and Baluchis in Deira, Indians in Bur Dubai, and Arabs alone in Shindaghah. 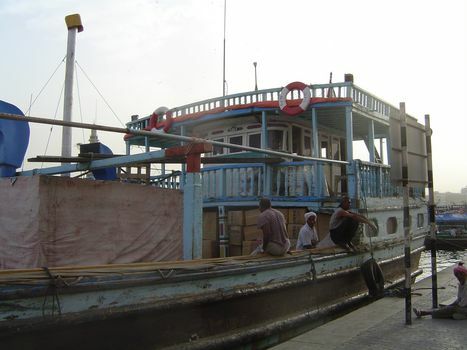 Only wooden ships are allowed to use the eight wharves along the Creek. 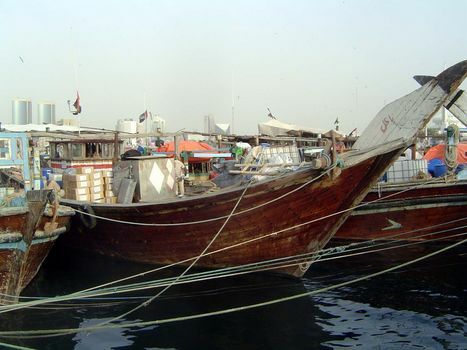 Steel vessels use Port Rashid at the mouth of the Creek or Jebel Ali Port, perhaps 15 miles to the west. Together, those ports handled more than 5,000,000 containers in 2003. 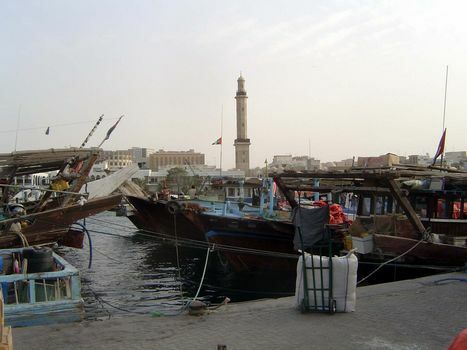 That put Dubai in the top dozen container ports in the world. 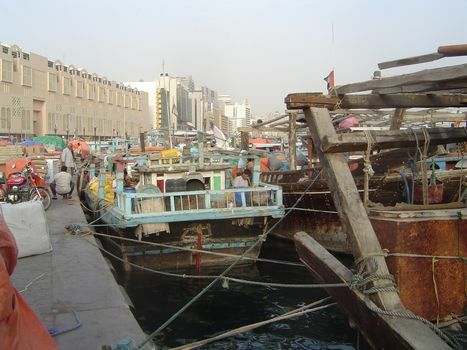 There's room for about 300 dhows at the eight wharves on the Creek. 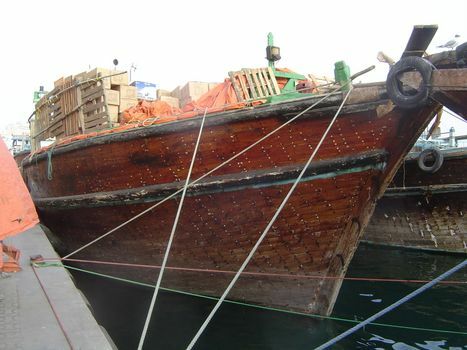 With a reported 720,000 tons of freight entering or leaving annually, and assuming an average dhow load of 250 tons, about 10 dhows enter or leave daily. 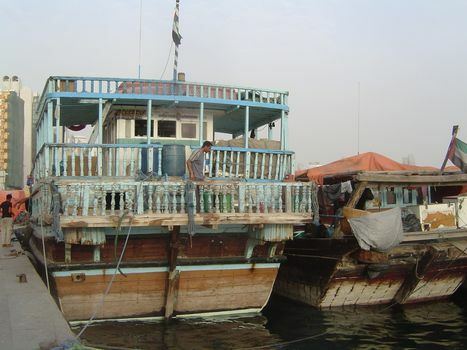 Destinations include Iran and Iraq but also more distant places: Yemen and Somalia to the West and India to the east. It's a vestige of ports in the pre-container days. 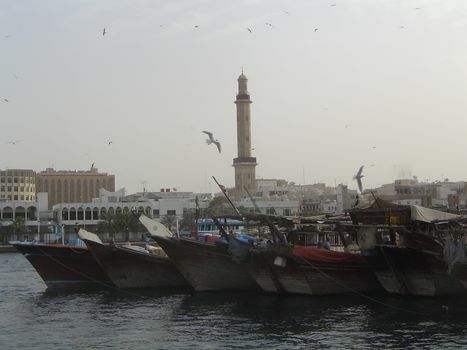 Stroll along the Deira quay. 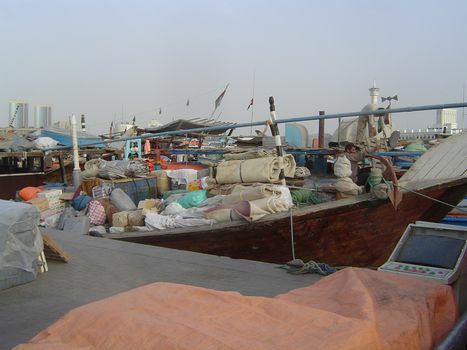 There's more shipping that wharfage, so the boats tie up side to side. 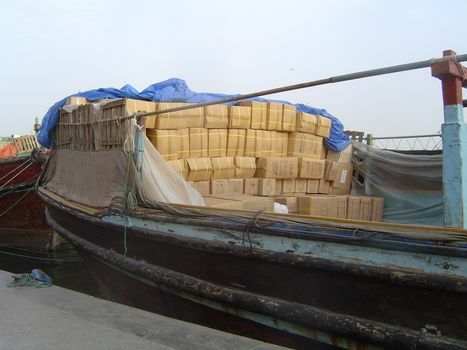 Everything's portaged, stacked, and secured by hand. He was brushing his teeth. Looking toward the sea from Shandaghah. As the paving suggests, it's been redeveloped in part as a public space. 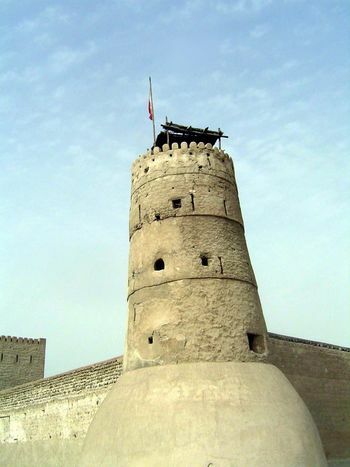 The tower is to catch the wind and deflect it down into the museum that was once the house of Shaikh Maktoum bin Hasher Al Maktoum. The towers have two flues on opposite sides of the tower. One is to push air to the room below; the other is for air to leave that room. Which is which depends on the wind's direction--often, on the time of day. The creek seen from the house. Sanitized, the museum retains the original simplicity of five residential units surrounding a courtyard. 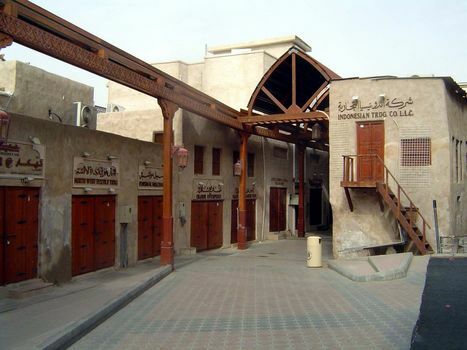 Sheikh Maktoum built the house in 1896 and lived in it until his death in 1958. 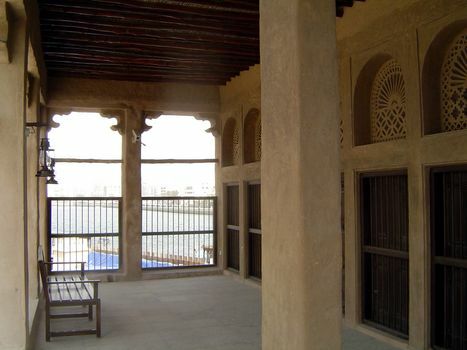 Restoration by Makiya Associates began in 1980 and was completed in 1986 at a cost of $2 million. 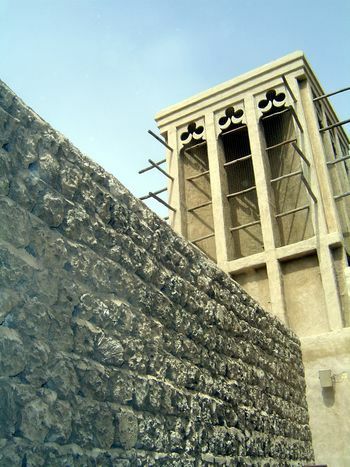 The walls, both inside and out, are covered with a farush plaster of sand, lime, and cement. Commendable? 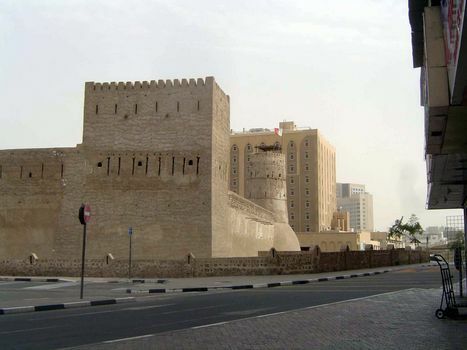 Maybe, but this is the only building in al Shandaghah that was spared "urban cleansing," in the phrase of Salma Samar Damluji, author of The Architecture of the United Arab Emirates, 2006, p.291. 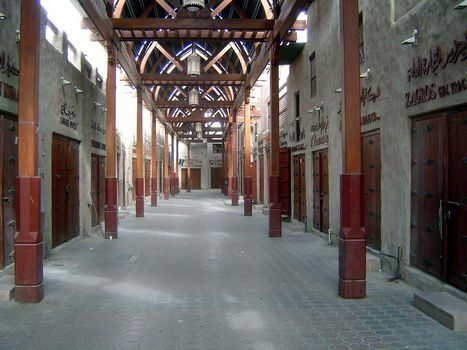 A ten-minute walk away, the new Old Souk. Nearby, the Al Faheidi Fort, now a museum. 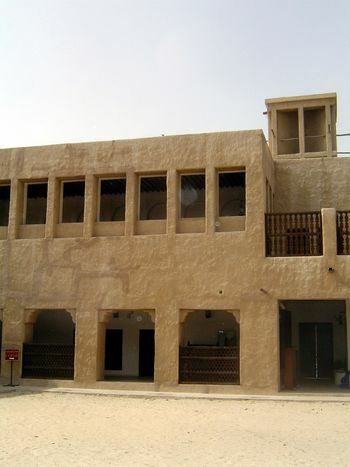 Sheikh Maktoum lived here until his move to the Shindagha house. 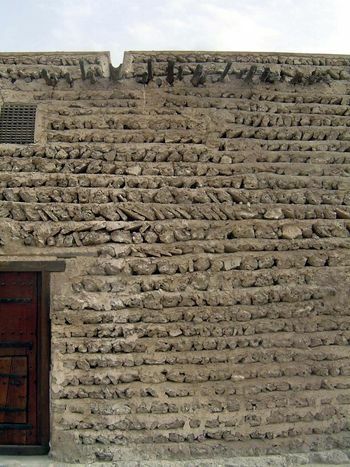 The most interesting feature may be the slabs of coral used as brick. 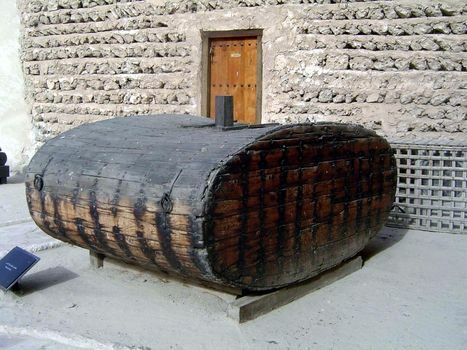 Old Dubai relied on shallow wells, but water was stored, too, as in this wooden tank.